1,Add profiles icon on desktop. 2,Remove the SMS on desktop,only messages and calendar. 5,Change the icons to the OS6 icons. 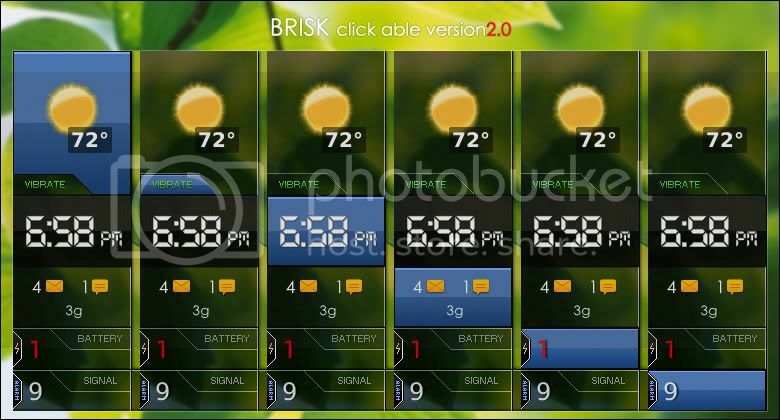 6,Include the new OS6 notification icons. 3,Make the dock 6 icons a little bigger. 4,Add the messages today area. 2,Change the hidden today to sms and mms today area. 3,Change the profiles icon to a customized icon in homescreen.You can set for profiles,weather application,etc. 4,Click unread icon to messages,Click battery meter to options,Click signal meter to manage connections. When click time,unread messages area,signal meter and battery meter on the desktop you will go to the Clock,Messages,Manage connections and Options. Digital battery and Signal meter. When the battery is low or the signal is weak the digital number will turn red. Clear font,user defined menu and message list font. No time lag and requires less memory. Last edited by Rose_MMDesign; 11-12-10 at 11:25 AM. 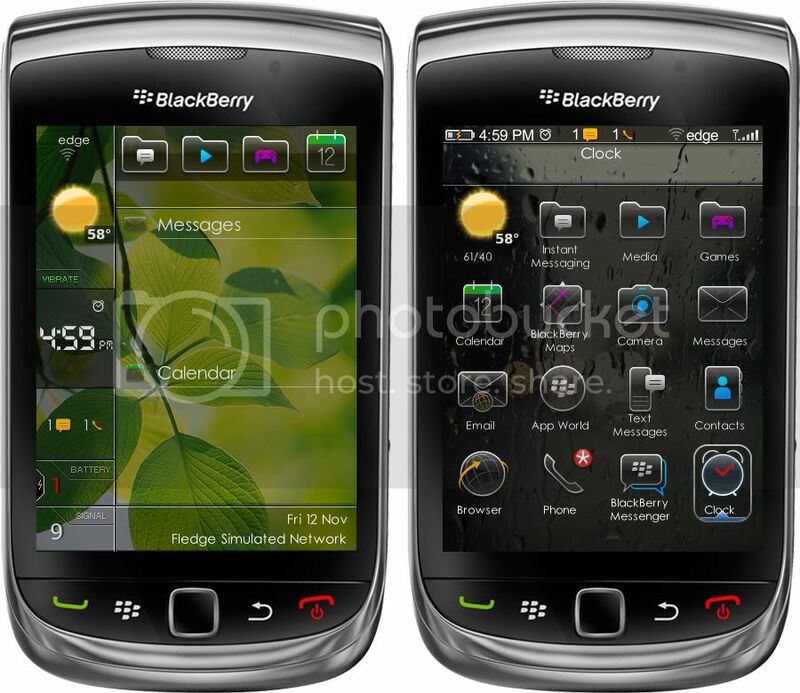 I purchased this theme for the Bold 9700 and have since switched devices to the Torch 9800. Could you please send me the Torch version? thanks! Hi I just downloaded this theme, but whenever I have the phone on its side, one side of the screen is all white. and when i position it upright it then instead of going back to normal shows me all my icons of all the stuff I have on my phone. And when i hit the go back button it goes back to the regular screen like in the pictures. 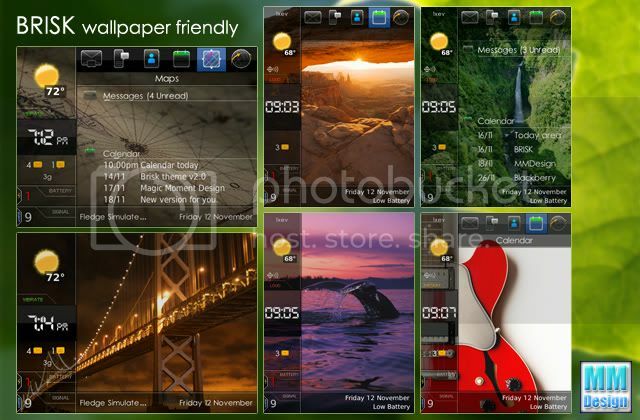 I am using this theme on my torch 9800. I have also done the battery pull and still nothing. can you give me a screenshot? I am sorry still new to this whole CB how can I send you a screenshot? I also use a mac. I have yet to receive the updated version? Pls advise. I swapped versions. And have yet to receive anxiously waiting for it! Thanks!! Rose: Great looking theme, but... the landscape mode seems to be an issue (see flex above), is there an update in the near future? Hi. So far enjoying the new theme. Also getting white space on the orientation flip, which is kind of annoying. Would like to know if there any way of switching the font size on the main screen under 'Messages' and 'Calendar'? Also, I have moved BeWeather into my customizable icon in the top left corner. Is there anyway the forcast text can show up as well? This is a great theme! As someone mentioned before, there is a bug in landscape mode, would be nice to make use of the entire screen. Otherwise great job!! Got the theme ported to my Torch. Love it but was wondering if you could fix the calendar / message area to make the font a little smaller if possible. And a fix regarding the landscape would be great. Also notice when you go over the profile icon the underlay does not properly fit. Thank you for your support and feedback,I'll fix it. thanks Rose, can't wait for the update! always loved this theme on my bold 9700 would you have an eta for the update? and also will you be porting your other theme to Torch also? I bought this theme after it was highlighted in the theme of the week post, and was really impressed, the portrait mode did exactly what I wanted from a theme, gathering all my info and all my 'buttons' in one place. If I have more than 2 notification icons, it goes 'off' screen, would be nice if it became a 2x2 grid but I don't think thats possible. Last edited by blindgeekuk; 11-17-10 at 06:52 AM. Thanks for the update Rose GREAT WORK!! Would it be possible to fix the today area to make the font a bit smaller so I can see more of it? and when I scroll around the profile area the underlay turns to a big box is it possible to fix? also the tilt screen wallpaper is it ok to change to the same wallpaper as the water mark in the original app page? Thanks! Does the QuickLaunch shortcut (date area) also work on the Torch? I'm looking for a theme with QuickLaunch shortcut, so that I can save my space bar for Universal Search function.